VedicMaths.Org - Newsflash - Singapore seminar etc. Newsflash - Singapore seminar etc. essential (if you want to be sure of a place) and not later than 31st October. be held at 5 pounds until the end of the year only. 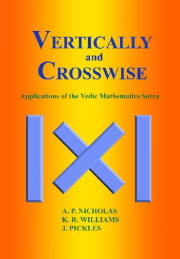 2- So What's so Special about Vedic Mathematics? 3 - SRI BHARATI KRSNA TIRTHAJI - More than a Mathematical Genius. 4 - The Vedic numerical code. 5 - "THE MATHEMATICS OF THE MILLENNIUM" Seminar in Singapore.